What did the apostles of Jesus go around teaching and preaching after Jesus ascended to heaven? Peter preached for around 35 years, and was martyred around 68 AD. John preached for more than 60 years, before he died in exile in Patmos. Well, we have the writings of the New Testament as a record of their testimony about what their Master Jesus taught and preached and how they carried on the mission He gave them, with John closing the writing of the New Testament at the end of the 1st century. However, there are skeptics who refuse to accept their writings. They say it has been changed or manipulated. What about the DISCIPLES of the apostles? What did the followers of Peter, John and the rest of the apostles of Jesus Christ learn from them? Did they receive the same message we Christians have today? Or did the message get lost somewhere? Let’s go to those who knew the apostles of Jesus Christ personally and see what THEY wrote and taught. We have a ton of resources. In this article, we will look at just one. In 107 AD, Ignatius of Antioch, was one of the last bishops alive who had known the apostles personally. Ignatius, together with Polycarp, were disciples of John, the apostle of Jesus Christ. Under Emperor Trajan, Ignatius was arrested, and in chains was taken 1500 miles over land and sea to Rome to be executed. During this arduous final journey on earth, he wrote seven letters to various churches and one to his old friend Polycarp and passed it through believers who had gathered in various cities, ports and towns to bid him farewell for the last time as he passed through. His letters have survived to this day and are an important testimony to the way in which the teaching of the apostles was remembered and taught and passed on. The letters witness to a common apostolic source of teaching as understood and lived, probably only a decade or so after the death of the last apostle, John. What do you think the letters say? 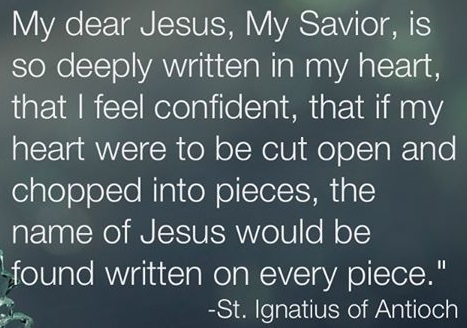 First, what did Ignatius believe about Jesus? Was He divine or just a man? 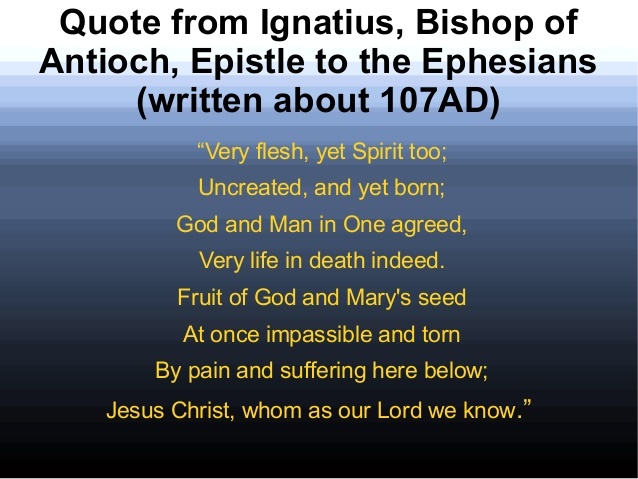 SIXTEEN times in his 7 letters, Ignatius explicitly refers to Jesus as God. Do you see that 200 years BEFORE the Council of Nicaea, Ignatius teaches that Christ is eternal, above time and all creation, and IS GOD, in the full sense of the term. One of the CORE teachings of the gospel is the death and resurrection of Jesus Christ. Keep in mind that these letters were written while on his way to his execution in the Coliseum of Rome, where he will be devoured by lions. There is no reason for Ignatius to make things up or lie in his writings. You can get an understanding of early Christian teachings from the 1st century, including his thoughts and emotions as he marches to his death, first-hand from Ignatius, disciple of John, the apostle of Jesus Christ. Besides the letters of Ignatius of Antioch, we also have the letters of others who have become known to us today as the ‘Apostolic Fathers’, the successors of the apostles.